More than four million visitors are the ultimate testimonial – spectacular Banff is a tremendously popular, world-class tourist destination. In 2017, National Geographic announced its annual Best of the World – 21 must-see places to visit – and Banff was the only Canadian location to make the list. And the new Canalta Lodge – with 112 rooms and lofts, glacier plunge pool, hot tub, sauna, fabulous collection of Canadian art, outdoor campfire and evening s’more service – is readying for its grand opening this fall as the newest accommodation draw in Banff. 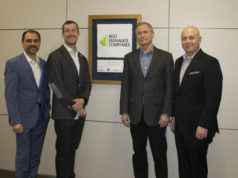 Canalta, the family-owned and fast-growing hotel chain based in Drumheller that owns and operates a portfolio of 44 hotels across Alberta, Saskatchewan and Manitoba, purchased the former Spruce Grove Inn in 2017 and is just finishing the $6-million renovations to the property located in the heart of Banff. “It’s an exciting addition to our Canalta family,” says Brooke Christianson, VP of Canalta. “What we have really is world class in every way. From the scenery of the majestic Rocky Mountains to the ski resorts, the hiking, biking, climbing, horseback riding and all the recreational opportunities. Christianson explains that Canalta Lodge features a modern and cheery interior, punctuated with hues of yellow and the rooms are decorated with black-and-white gingham linens that intentionally evoke a cabin feel. 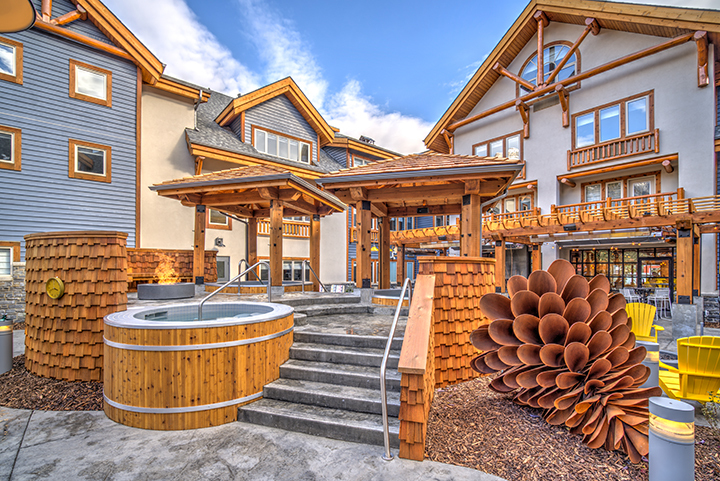 “The U-shape design that wraps around the spacious courtyard features hot tubs and cedar-barrel saunas and fire pits for gathering around and telling tales with friends,” he adds.